in connection with "Imagine Science Abu Dhabi"
What will survival mean for us in the near future? Many place their hope in better technologies and smarter algorithms. In SURVIVAL, artists explore the ubiquity of urban surveillance and resulting human adaptation, the mysteries of perception that will need to be solved before machines can see the world as we do, and the algorithmic observation of the end of the world via the endless data offered by social media. New technologies also offer us a means to modify or improve ourselves. How might CRISPR gene editing technology allow adjustment of our personalities? Meanwhile, the natural world perseveres: the beleaguered ecology of the anthropocene continues on and the simplest organisms endure the complex requirements of survival. The apocalypse is constantly present in our collective consciousness – with all the recent news pointing to it and Hollywood blockbusters priming us to start rebuilding once it comes and some of us manage to survive. The End Is Near tries to tap into this fear we share. Every time someone tweets the string “the end is near”, the artwork obtains the user’s current location and finds what the sky above them looks like. A moving-image installation exploring the twisted courtship rituals of sea-slugs. Interplay between multiple light sources layer photographic samples of the slugs’ skins and habitat, which are revealed through a series of peep holes into their tiny world. Today the gene editing technology CRISPR/cas9 allows fast and precise applications to alter genes of all living entities. The emotionally triggering speculative design scenario, realized as a short film and as a fictional gene-editing device, thematizes the phantasmatic drive towards happiness as the ultimate goal of human existence in the era of synthetic biology. Conceptually the work sets its focus on the Greek philosophy of Eudaimonia, as one of the most fundamental concepts of “good life” as self- development technique. Three individuals of a broken family are seeking help from mysterious novel technology in their quest to find happiness. The dark poetic story draws a picture of a possible near future where the human soul has become a matter of genetic engineering. How do we understand something we never experienced ourselves? The film installation ‘A memory of the future’ is a cinematic search in how we construct reality through our perception. What we perceive is a creation of our brains, filled in by previous encounters, memory, and expectation. Where the City Can’t See is the world’s first narrative fiction film shot entirely with laser scanners. Set in the Chinese owned and controlled Detroit Economic Zone (DEZ) and shot using the same scanning technologies used in autonomous vehicles, the near future city is recorded through the eyes of the robots that manage it. Across a single night a group of young car factory workers drift through the Detroit in a driverless taxi, searching for a place they know exists but that their car doesn’t recognize. They are part of an underground community that work on the production lines by day, but at night adorn themselves in machine vision camouflage and the tribal masks of anti-facial recognition to enact their escapist fantasies in the hidden spaces of the city. They hack the city and journey through a network of stealth buildings, ruinous landscapes, ghost architectures, anomalies, glitches and sprites, searching for the wilds beyond the machine. We have always found the eccentric and imaginary in the spaces the city can’t see. Mesocosm (Wink, Texas) is part of an ongoing series of animated landscapes that develop and change over time in response to software-driven data inputs. The title is drawn from the field of environmental science and refers to experimental, simulated ecosystems, which allow for manipulation of the physical environment and are used for biological, community, and ecological research. In Wink, Texas, a large sinkhole— the “Wink Sink 2” located on private oil company property in the small Texas town of Wink—boils, gushes, flows and expels objects: plastic bags, oil and dark clouds that whirl out of the sinkhole’s vortex in ghostly choreography. Oil refineries burn off gases in plumes in the background as an occasional train or coyote lumbers past. This sinkhole has been widening steadily since it emerged in 2002; here, it appears as a natural geological event, complete with picnic rest stop furnishings. By day, the landscape is inhabited by a diversity of bird life, prairie dogs, insects, pronghorn antelope, HazMat workers and—depending on the season—by migrating monarch butterflies, snakes and sandhill cranes. Opening Reception: Wednesday January 30th at 6:00pm. Marina Zurkow is a media artist focused on near-impossible nature and culture intersections, researching “wicked problems” like invasive species, superfund sites, and petroleum interdependence. She has used life science, bio materials, animation, dinners and software technologies to foster intimate connections between people and non-human agents.Her work spans gallery installations and unconventional public participatory projects. Currently, she is working on connecting toxic urban waterways to oceans, and researching the tensions between maritime ecology and the ocean’s primary human use as a capitalist Pangea. Zurkow is a full time faculty member at ITP / Tisch School of the Arts, New York University, and is represented by bitforms gallery. Liam Young currently lives and works in London as an independent urbanist, designer and futurist. Liam was named by Blueprint magazine as one of 25 people who will change architecture and design in 2010. He is founder of the futures think tank Tomorrows Thoughts Today, a group whose projects explores the consequences of fantastic, perverse and speculative architectures and urbanisms. His projects develop fictional near-future scenarios as critical instruments to instigate debate about the social, architectural and political consequences of emerging biological and technological futures. Liam also curates events and exhibitions including the annual Thrilling Wonder Stories series and co produces the nomadic teaching studio the ‘Unknown Fields Division’ at the Architectural Association in London. 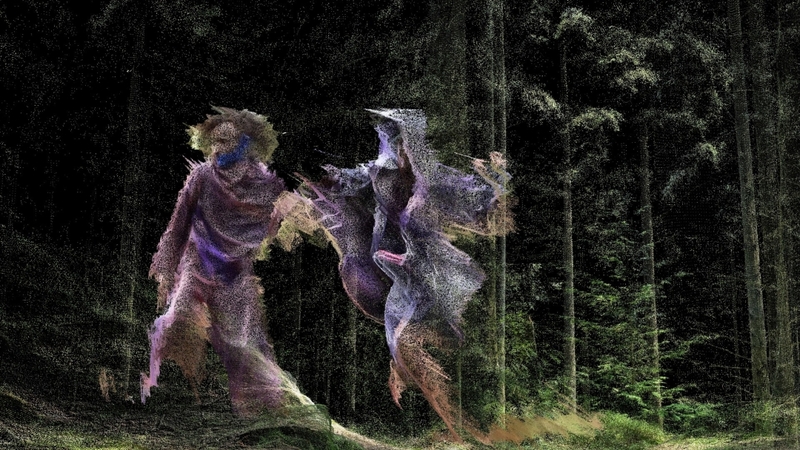 Marleine van der Werf (NL / CH, 1985) is a filmmaker and visual artist based in Rotterdam. Her films and installations depart from a documentary perspective in which she researches the perception of the ‘Other’. Recurrent themes are the (sub) consciousness, perception of reality and embodiment. Van der Werf creates poetic cinematic worlds and experiences in which she challenges ideas of how we construct reality. Combining analogue film, projection techniques and virtual reality she creates sensory experiences with strong content to engage and connect people. Emilia Tikka is designer and artist, lecturer and researcher – originally from Finland but based in Berlin. Currently she has been selected as the artist in residence at Max-Delbrück-Centre for Molecular Medicine and State Festival, the first European artistic residency on the gene-editing technology CRISPR-Cas9. Her interdisciplinary design and research practice explores philosophical dimensions and cultural implications of novel biotechnologies such as synthetic biology and gene editing technology CRISPR-cas9. Her methods of research vary from designing objects, constellations, concepts and future speculations to writing and hands-on laboratory experiments. Emily has a background in photography, an obsession with texture, colour and nature – and a Masters in Animation from the Royal College of Art, London. Her projects often begin by collecting specimens, then manipulating them through analogue photographic and mark-making techniques to produce print & moving-image works. Also recording and working with sound to create ‘audiovisual concoctions’. Born in 1993 in Zilina, Slovakia, Franz Milec is currently pursuing a Master’s degree in Audiovisual Studies at the Academy of Performing Arts in Prague, Czech Republic. Regardless of medium, he considers himself an essayist, seeking to uncover the complexities of what we perceive as banal and unimportant; to give a second look to something that is taken for granted or even designed to go unnoticed. Recently, Milec started exploring the intersection of film and data visualization, and his works are headed towards full automation and AI. He aims to bring film into the 21st century by developing open source tools and using open data and imagery.